Currently on scholarship with the Australian Institute of Sport (AIS) in Adelaide, South Australia, Bawden was a member of the Australian Indoor team from 1998 through 2004. 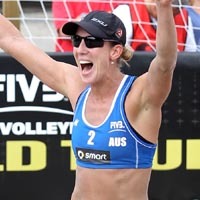 A member of Australia's Sydney 2000 Olympic and 2002 World Championship teams, she played in the Dutch league for three seasons (2001-2003). Her most memorable volleyball moments was winning a match at the Sydney 2000 Olympic Games and the finals of the qualification tournament for the 2002 World Championships. Bawden's goal is to be competitive internationally while earning a berth for the London 2012 Olympic Games. Her hobbies are reading, procrastinating on the internet, fashion and gossip magazines, talking, socialising, the beach, sleeping, and good food and wine. Why do I play? - I love volleyball! I also enjoy the challenge of training, competing and pushing myself to achieve a better standard every day. I love to travel and volleyball offers me great opportunities to see the world and meet interesting and talented people.